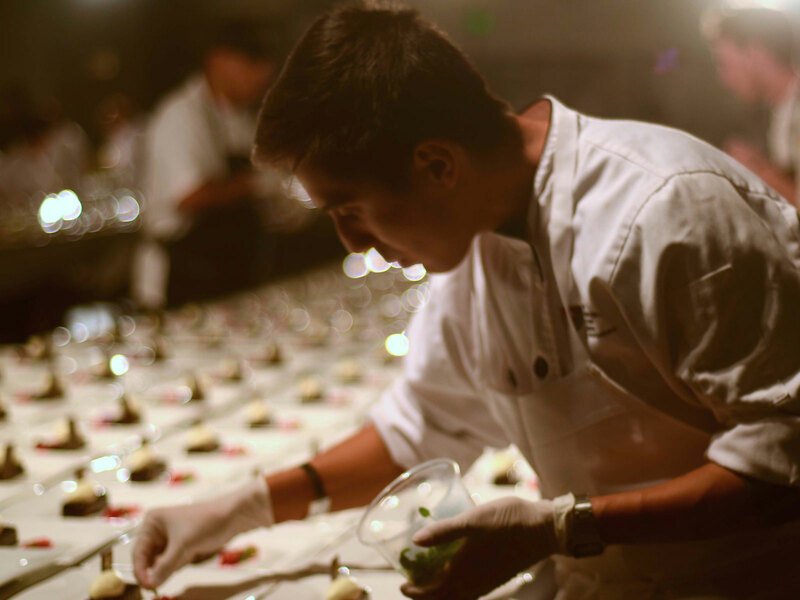 The Microsoft Theater becomes a Wonka-like production, where chefs cut 9,000 pounds of heirloom tomatoes and sear 3,000 pounds of filet mignon. 8,000 dinosaur plums, 16,000 mission figs, 3,000 pounds of filet mignon and 20 gallons of red wine sauce with whole-grain mustard: this is how James Beard-winning chef Joachim Splichal feeds the illustrious hordes of guests at the Emmys. On a perfectly warm night this past weekend in downtown L.A., the Creative Arts Emmys had just concluded. (Most people don’t realize there are three separate award shows; the big one takes place on September 17, and the same menu is served at all three. Among the three, there are almost 9,000 guests.) This evening, winners included Kristen Schaal, Common and Meryl Streep. Anthony Bourdain’s Parts Unknown was, of course, nominated in several categories for a repeat year. Amidst it all, behind a black curtain, Splichal walked around making sure that 2,500 plates of filet mignon were plated identically: with purple potatoes, figs and a red wine reduction. In just twelve hours, his team had transformed an empty hall into a functional kitchen. And now, it was a Wonka-like production facility, where they’d be cutting 9,000 pounds of heirloom tomatoes—picked the day before each event—and searing 3,000 pounds of filet mignon. A mile away, their prep kitchen had been humming for twenty hours. Splichal has been doing this for twenty-two years. “The first five years were pretty crazy until we got all the problems worked out,” he says. Ten years ago, he remembers discovering that the about-to-be-served mashed potatoes were sour. With dinnertime quickly approaching, he sent runners to buy up all the instant mashed potatoes and cream they could find. Four hours later, he somehow managed to feed 4,000 people. These days, if someone wants, say, an alternative milk or a Weight Watchers meal, he has people at a nearby Whole Foods who can grab special orders. Every year, Splichal starts working on the menu in January or February. He and his team come up with ten appetizers, ten beef entrées, ten vegan entrées, ten fish entrées and ten desserts. Then they send the menu to the Television Academy, which chooses two or three in each category. In April, a team of twenty picks final winners; in August, a committee of eight taste the dishes one last time. Two dishes this year that didn’t make the cut were a beef strudel tart with heirloom tomato and a farmer’s market salad with roast squash, figs and baby lettuces. Delicate greens are a challenge served in high volumes, because they wilt in the time it takes to plate them—about forty-five minutes for 2,000 people. Heavy salad dressings are also off-limits; vinaigrettes separate and exacerbate wilting. That’s why, for the first course, Splichal and Patina executive chef Gregg Wiele came up with a balsamic jelly cube. At first glance, it looks like a cubed beet, but it’s just salad dressing in jelly form. Before the dinner began, we came in for a sneak peek. 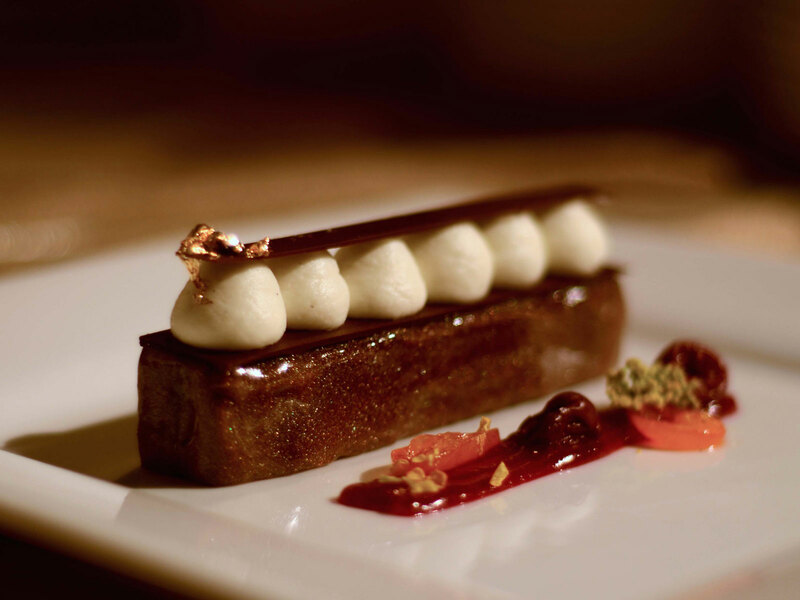 Rows upon rows of line cooks were plating the fanciest brownie we’d ever seen: glazed in chocolate, garnished with cherry gel and raspberries and crowned with edible gold foil to go with the “Golden Grandeur,” this year’s official theme. Two men with tweezers were going up and down rows of tables, placing single pansy flowers on top of the dish. “We’re on deadline,” a head chef called out, shooing us away. We hurried out into the ballroom, where we may or may not have been hoping to catch sight of Kristen Schaal. At the tables, bubbly was being poured, but for the first time in Emmys history, it wasn’t Champagne. Instead it was Ferrari Trento, a sparkling wine grown slope-side on the Alps. Its crispness is attributed to the high elevation at which the grapes are grown. For cocktails, Ciroc Vodka was on offer—the company is partially helmed by P. Diddy, and the vodka is made from grapes, not grain. Below you’ll find a cocktail recipe. Because, although we won’t win an Emmy on Sunday, just holding a Champagne cocktail in our hands makes us feel like we’re winning. Instructions: Combine Cîroc, lemon juice and simple syrup in cocktail shaker over ice. Shake gently. Roll in champagne and strain into a chilled coupe glass. Mist cocktail with lemon oil and garnish with a twist.